A scientific definition of geography refers to the study of the physical features of the earth and its atmosphere, and of human activity as it affects and is affected by these, including the distribution of populations and resources, land use, and industries. What this means is that as human beings, we play an important role in the past, present, and future geography of the Lower Sugar River Watershed! We are part of the living story of the watershed's geography and our decisions today will impact the health and well-being of the land, water, and people in the watershed for generations to come. 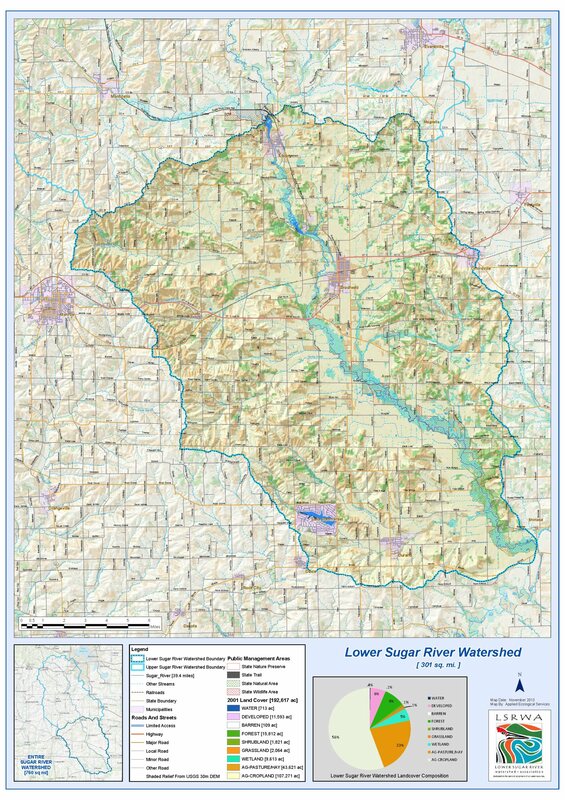 The Lower Sugar River Watershed – The Lower Sugar River Watershed (see map) covers 192,617 acres (301 square miles). It begins near Albany, WI. in the north, extends west to the outskirts of Monroe, east to Orfordville, and south to Shirland, IL where it flows into the Pecatonica River, crossing the boundaries of four counties and two states. The watershed covers portions of Green and Rock Counties in Wisconsin and Stephenson and Winnebago Counties in Illinois. The Lower Sugar River Watershed is composed of the Sugar River and several subwatersheds. The Lower Sugar River, as with the majority of the Sugar River basin, is largely rural in nature with 79 percent of the land use within the watershed consisting of agricultural land. The remaining land use in the watershed is a matrix of forests (8%), developed lands (6%), wetlands (5%), shrublands (1%), grasslands (1%), barren lands (0.1%), and water (0.4%). LSRW Natural Areas-A number of natural areas are found across the Lower Sugar River Watershed. Wisconsin’s Department of Natural Resources (WDNR) manages the Avon Bottoms Wildlife Area, Avon Bottoms State Natural Area, and Sugar River State Trail. The University of Wisconsin owns several sites designated as State Natural Areas including Abraham’s Woods, and Oliver Prairie. The WDNR manages Ward/Schwartz Decatur Woods, which is also a State Natural Area. The Sugar River Floodplain Forest is recognized by the Wisconsin Wetlands Association in its Wetland Gems™ program. In Illinois, Winnebago County Forest Preserve District manages the Sugar River Forest Preserve, Sugar River-Alder Forest Preserve, and Colored Sands Forest Preserve and the entire Illinois portion of the watershed is considered a Resource Rich Area. Additional natural areas are protected through the work of private landholders, and a number of not-for-profit organizations such as the Natural Land Institute, The Prairie Enthusiasts, and Natural Heritage Land Trust among others. Subwatersheds – The Lower Sugar River can be divided into 13 subwatersheds that range in water quality from impaired to Outstanding and Exceptional Resource Waters. One focus of the LSRWA is to improve the quality of the impaired subwatersheds, and monitoring work for this effort has already begun through our Citizen Science programs.